Now available in a titanium version, this Limited Edition run of the OM-D E-M5 Mark II Mirrorless Micro Four Thirds Digital Camera from Olympus stands out by bundling a matching leather shoulder strap and a serialized owner's card, which also has its own dedicated leather case. This model still shares the excellent performance and feature set first brought out with the original by combining a 16MP Live MOS sensor with a TruePic VII Image Processor for increased performance speed and reduced noise throughout the ISO range as compared to TruePic VI. The Mark II also improves upon its predecessor by utilizing a 5-axis VCM Image Stabilization that provides up to 5 stops of compensation. Full HD 1080p video recording is now available on the Mark II with a higher bitrate of up to 77 Mb/s and various codecs. Built into the E-M5 Mark II is a unique feature that utilizes sensor shift to produce a 40MP image by combining 8 images in-camera. Box Dimensions (LxWxH) 9.4 x 9.1 x 3.7"
OM-D E-M5 Mark II Limited Edition Mirrorless Micro Four Thirds Digital Camera (Body, Titanium) is rated 4.4 out of 5 by 105. 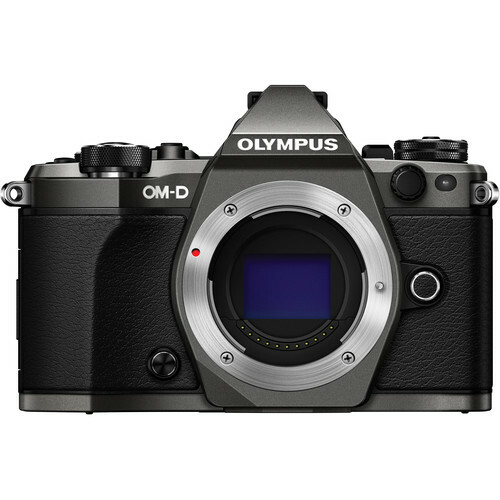 Rated 5 out of 5 by Anonymous from OM-D E-M5 Mark 2 Camera Review 1. I'm avid adventurer and traveler thus carrying this camera is amazing because of how light it is! My genre of is landscape and travel photography. 2. I love the 5-axis stabilization. I have taken shots at 2 seconds (most) handheld and there was very little shake in the result. The photo quality is undoubtedly professional like. The weather sealed body is definitely an advantage as I have taken shots under the rain and there wasn't any damage to the camera. 3. Olympus could definitely improve the grip and ISO range on the camera. Since I shoot a lot on the go, I could really use an ISO as low as 60. The battery life is also not really lasting. I notice the battery draining really fast the moment I hit the 200 photo mark. Rated 5 out of 5 by Jeremy P from My favorite camera! Before purchasing this camera, I rented at least one pro micro 4/3 camera offering from each of the manufacturers. The 5-axis stabilization that is built into this camera works magic. And the user interface, ergonomics, tilting screen, and fantastic lenses of the Olympus all won me over. This is one solid camera. If you are looking for a professional micro 4/3 camera, look no further. I am looking forward to whenever a Mark III of this or a Mark II of the EM-1 comes out, hopefully with higher resolution. But this is more than capable in the meantime. Rated 4 out of 5 by Curt from Fun alternate to my D800 Bought this as a lightweight alternative for when I don't want to carry my full frame dslr and heavy glass. It replaces a Sony 4-100888 which was ok, but not sturdy and just plain dull to shoot with. The E-M5 ii is a whole different story when combined with good glass. Totally engaging, yet small enough and solid enough to keep with me most of the time. At first I was apprehensive about only 16mp, but the recalled my former, beloved d300 performed well with less. The menus and configurability are daunting at first, but I've now settled into a set of configurations that work well for my needs. Two starsoff for anemic continuous focus. This isn't going to replace a dslr in action situations. One star back for phenomenal ibis performance. Rated 5 out of 5 by Anonymous from I Love It At first, I was going to regret purchasing this. I'm not a pro photographer, and I was previously using a Canon T3i. I wanted to move into the mirrorless level since my DSLR was really bulky to put into my bag. In the beginning, the functionality was different and I wasn't used to it. The electronic viewfinder was a bit strange, but I got over it. I love every feature of this body. The metal construction, the weatherproofing, and all the features it comes with. The rotating screen was the most useful feature I used. The only downside for me, is that the battery life is kind of bad. Other than that, everyone compliments this cool camera, and it was well worth the money. Rated 5 out of 5 by Marty85086 from A wonderful camera that renewed my interest in photography I have owned the OM-D E-M5 Mark II for about 6 months now. Unlike the previous review, I have found the camera to be very easy to use and feature-packed. Unlike my previous DSLR camera, the OM-D E-M5 Mark II includes so many exciting features, like 4K time-lapse videos, live composite photography, HD video and more while delivering superb quality. Combining ease of use with incredible capabilities, the camera has gotten me excited about photography again. I would recommend it to anyone. Rated 5 out of 5 by MGFinLA from Amazing camera that does it all This is the 3rd Olympus camera I've bought, each one an upgrade from previous model. The E-M5 MarkII is by far the best camera I've ever owned. My Canon and Nikon are gathering dust as this is now my goto camera for most shooting situations. Coupled with the new Olympus 14-150 f4.0-5.6II lens there isn't much you can't shoot and shoot well. Not much of video shooter but the little bit I've done is high quality and extremely even due to the incredible new stabilizing system on this model. Rated 5 out of 5 by Robert from got my love back I am a semi-retired pro photographer. When everything went digital I reluctantly sold my beloved OM-D film camera systems and started using a Canon EOS 7D. I recently had to evacuate during the California Valley fire and decided not to take the insured camera which shows you how much I valued that particular camera. Unless you are purchasing the top of the line cameras from Canon or Nikon you are forced to accept compromised equipment. I never get that feeling from Olympus. The 7D produced really good images but it always felt like a bulky compicated device rather than a camera and I never felt inspired using it. The OM-D E-M5 Mk II has restored my inspiration and unlike the 7D I feel an emotional commitment to it. Olympus thinks of the little things like a lock on the mode wheel. I had many shots ruined by the 7D because the mode selector was so easliy moved off the desired setting. A disaster waiting to happen for a wedding photographer especially. The high res mode on the OM makes up for any regret not having full frame. Just get a Pro lens and there is no downside to this camera IMO. I have a Promaster 5550DX flash with an OM Digital module that I used with my Olympus C-700. It uses a flash-sync cable, not a hot shoe. Does the OM-D E-M5 have a flash-sync cable terminal that would be compatible with this flash? This camera does not have a sync port. Asked by: Philippe G. R.
Options for Square Trade can be viewed by adding an item to your shopping cart. Can we use cannon lenses on this camera? You can but you will need an adapter specifically with electronic components to carry over the Canon autofocus. As indicated under the In The Box tab on our website, the Olympus OM-D E-M5 Mark II Mirrorless Micro Four Thirds Digital Camera comes with a 1-Year Limited Manufacturer Warranty covering manufacturer defects and workmanship. Can this be used as a webcam like the Canon EOS line can be used as? Not sure it is completely no. There is software that comes with the camera that allow streaming to a tablet and there is a USB cord that allow like tethering to your computer. Both, or either might accomplish what you want. Can't decide on a lens for the olympus m d e m 5 mark II? The 14-150 4.0-5.6 II, while somewhat expensive, takes great photos, it's lightweight, VERY versatile and it's weatherproof! You'll actually save money because you've reduced the need for other lenses. PRO lite! Full disclosure, I did get the 25m f1.8 as a fast prime. I understand that the camera can turn a time-lapse series of photos into a movie. Are there limits on what the camera can compile? In other words, can I take x number of photos over, say, 8 hours and turn them into a 2 or 3 minute movie without jumping through hoops? Yes, the camera can do time-lapse with little or no fuss. You set up the number of frames (999 max), the interval, start delay if desired and the option to tell the camera to build the movie rather than having you pull all the still frames and build it yourself. You can download the manual from Olympus and see the specifics.